Get YOUR COPY of Chasing Moonlight with a Donation of $5o or more! 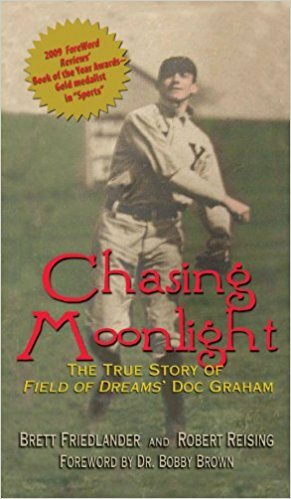 In 1906 and 1907, Moonlight Doc Graham played seven documented games at A.J.&G. Park/Parkhurst Field as he pursued his dream of making it big in Major League Baseball. In “Chasing Moonlight”, Brett Friedlander and Robert Reising prove that truth is more interesting than fiction. The real-life Moonlight Graham didn’t play just a half-inning for John McGraw’s New York Giants, as depicted in Field of Dreams. Neither did he retire from baseball after his lone major league appearance. Rather, he became a fan favorite during a noteworthy professional career, all the while juggling baseball with medical residencies. The JAGs, the local semi-pro team which played at Parkhurst Field from 1906-1908, are mentioned in the classic book a number of times as it chronicles the playing career and life of Graham. Field of Dreams is a trademark and copyright of Universal Studios. Licensed by Universal Studios Licensing LLC. All Rights Reserved. Such permitted use is not an endorsement by Universal Studios.